Since the popular Brazilian Sitio Canaa came to an end, a replacement from our current Central American harvest for our next single origin espresso was always on the cards. Over the past 3 weeks, we have been featuring something which we codenamed as “Project X”. Through our cuppings and feedback from customers alike, we have made tweaks to the roast profile and are now ready to reveal the “secret identity” of this bean showcased in our 2nd hopper. Situated in the Jinotega region of Nicaragua, this small farm sits perched on a cliff high above the beautiful Lago Apanas, north of Jinotega. Finca San Jose was purchased by the Mierisch family in 2003. The Mierisch family also owns – Finca Los Placeres and Finca La Escondida. Both of these farms have already made their appearances in our shop over the past 2 months. Finca San Jose is divided into sections to facilitate tracking, as coffee is harvested everyday during the harvest season, which runs from January to February. Every sack of cherries harvested notes down the area within the farm and the workers’ names. At Finca San Jose, all the cherries are handpicked. The workers are rewarded by picking only the ripest cherries. The Mierisch family has put in a lot of effort to give back to the communities who work and live the various farms. Some of the initiatives include providing access to childcare for working mothers in the farms, educational programs for children, fully stocked and functional clinics at the farm, nutritional programs and a general store stocked with low cost sundries for the communities. All these resulted in total commitment from the working staff at the farms to produce great coffees. 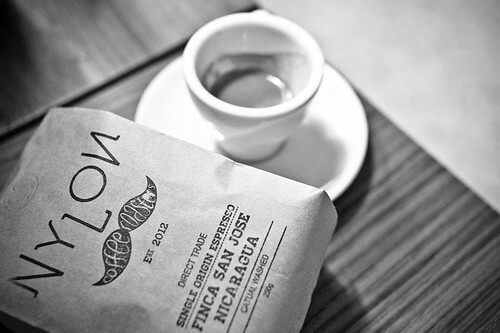 As an espresso, Finca San Jose exhibits deep red fruit-like lively acidity (reminiscent of plums, raisins), hints of tropical fruits, pleasant sweetness, lovely syrupy mouthfeel ending with a dry finish. With milk, expect plenty of chocolate, resulting in a smooth and comforting cup right down to the last drop. We are really excited to be able to work with the wonderful folks who are part of the Mierisch family and bring this wonderful bean to share with you at Nylon. Do drop by and try it when we have it in our hopper, or grab a bag of our retail rack & have fun making some coffees with it.